The location for this new event is Chipping Showground, which is located on the the left side of Longridge Road about 1/2 a mile from Chipping Village. There will be a £1.00 car park charge on the day. The car park is situated on the right of the gravel track as you enter the show ground. Please follow the directions of the car park marshals. The car park is off road and whilst the ground is good, we advise you drive accordingly to reduce damage to the land and allow your tyres to grip. If anyone does get stuck, there will be a tractor on hand to assist with vehicle movement. There is a toilet block with male/female and disabled facilities, along with a baby changing area. There is cold water standpipe at the toilet block and also at the outbuilding where the sign on/registration is situated. Refreshments will be available on the site, with coffees and teas by Jonah’s Coffee Company. Unsworths Delicatessen will be serving his famous sausages and Megan Bennett will have her selection of cakes and confectionary. Caf Cycling Apparel will be there with their range of great cycling socks and apparel. We are hoping The Fell Bike Store will be supporting us on the day with a Mechanic and with a display of their cross bikes. We ask that you respect the countryside code and take your litter home or put it in the bins provided. This site is grazing land and there will be stock going on it after we finish. Sheep do like gel wrappers and the like, but they become an expensive vets bill to the farmer. We are guests of the show ground and we would like to be allowed to return next year. 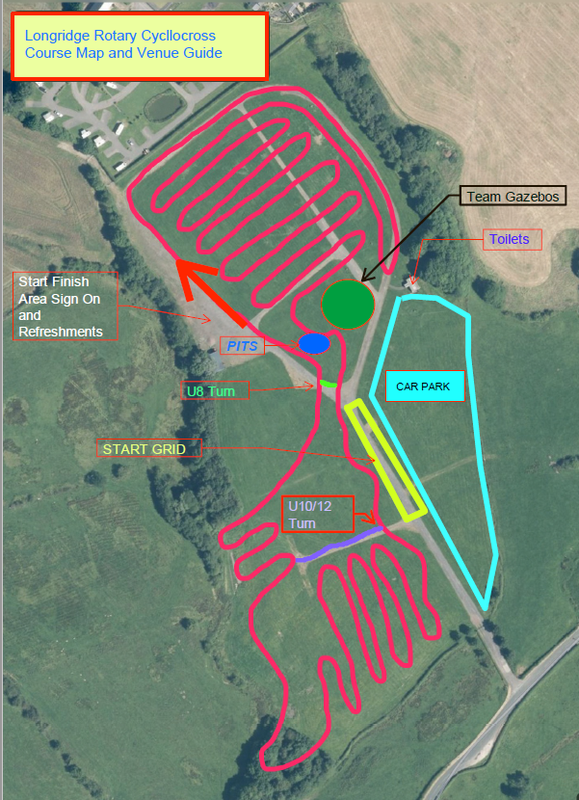 The course will be set up on the Friday before the race and if you have volunteered to help on this one, Mark Goodchild (the organiser) will be there from 10am onwards. If you bring your bike you will have a chance to have a pre race recce. This is a very spectator friendly event. The course (below) is such that you can see virtually all of it from the centre, so invite your friends. We would like to see as many people there as we can.